I began this blog in April, 2010 as a document of what I thought would surely be our finding a cure for my daughter’s autistic neurology. At the time I did not question that this was a worthy goal and one I should be pursuing. At the time, all I could see were the things challenging her, making her life more difficult with no upside. She was, I thought, the victim of a neurology that caused her nothing but pain and suffering. It was not until I was confronted with the joys, things that I had witnessed right from the beginning of her life, but, after receiving her diagnosis then ignored and dismissed, that I began to appreciate the more complex truth about autism and what that might mean to her. I could not have imagined that four years later my daughter would be posting her profound insights about life, her neurology and the impact society has on her, not because we found a cure, but because we didn’t. For those of you who have read this blog from the beginning, or poked around and read a post or two from those early days or those who’ve looked through the archives of the pieces published on Huffington Post, you will see a transformation. It is not a transformation of my daughter’s neurology as was once my goal, but a transformation of our thinking, and as a result the impact our thinking has had, not just on her self-esteem, but on our ideas about ourselves, individually and as a family. We had to examine and question our own neurology and the challenges we face as a result, before we were able to fully appreciate hers. We do not take credit for who she is becoming. We cannot. My daughter is strong, stronger and wiser than I have any right to claim influence on. While it has certainly helped that we no longer fight against her neurology, but instead encourage, support and provide her with the help she needs to flourish, it would be wrong to suggest who she is and is becoming is all due to us. Had we not found people who believed completely in her, people who saw beneath the words she spoke, the way her body moved, had they not shown us and encouraged us to question our beliefs and set them aside, to look beyond what we thought we were seeing and what that meant, we would still be lost in the horror of what we once thought and were told “autism” meant. This concept, that of helping an Autistic child flourish to be all they autistically can be, is counter to all that we non autistics are told and urged to believe. So much of the focus is on making our Autistic children behave and appear less autistic-like. Appearing non autistic is the emphasis and the fact that this comes at a price, is not often spoken of or even considered among the non autistic population. Many people see Autistic people, witness their inability to say what they feel and think, and believe there is nothing more to see. They come to conclusions, having witnessed the person’s movement, their facial expressions or lack of, and believe what they see and what they then conclude is the “truth”. Assumptions can create all kinds of misunderstandings that hurt a population who do not follow the unspoken rules of a majority. (Trigger for abuse contained in links) Misunderstandings that then lead to abuse. Beliefs, like this and this are expressed and taken by many as fact, regardless of how misinformed, regardless of how shoddy the reporting, which further harm people and children, like my daughter. The cure I seek now is for our society. A cure for intolerance, sameness at any cost, and for those who seek to silence those who cannot speak with spoken language, but who have a great deal to say through the words they write, is what I dream of. One of the many down sides of non autistic neurology is how we struggle mightily to blend in, to fit in at all and any cost. We strive to be better than, to keep up appearances, to cover our awful feelings of insecurity and discomfort with pretense and by controlling those around us. Some become obsessed with money and power and yet once they have both, they use it to further separate themselves. Where and what is the cure for that? This is the journey I now find myself on. There are others farther ahead, I am doing my best to follow. There are many who learned all of this sooner than I did. There are some who will read this and because they have been on this road longer, will see how far I still have to go, but this is a trek, the best sort of trek, filled with discovery and beauty. Emma is leading the way now. I really am just trying my best to keep up, while remaining open to all that I still do not know, but am eager to learn. This entry was posted in Autism, communication, Parenting and tagged assumptions, autistic, beliefs, communication, Cure, Neurology, non autistic neurology, non-speaking, Parenting, presume competence, rules, societal expectations, society, transformation. Bookmark the permalink. Wonderful! I look forward to further following your self discovery and how I and others can learn from it to help our beautiful Autistic loved ones. And then there are others who follow behind you. 🙂 and hopefully others will follow behind me…maybe someday no one has to follow anyone…we will all know from the beginning. Ah… won’t that be wonderful? Thank you for sharing the evolution of your perspective. There are so many places where people fall on this path, it is wonderful to be reminded to not judge others’ starting points by my middle. Really appreciate you saying this as I too need to be reminded of this as well! Am on a similar journey, likely a bit further behind you but trying to catch up. My son is young and of a different neurology (similar to autism but not necessarily on the spectrum) and it has been a wild and wondrous ride. I enjoy your blog very much – it’s so meaningful to share these experiences and insights! And I think it’s wonderful how this message of hope can transcend beyond an audience of special needs parents – in general, people seem to recognize and appreciate the overwhelming need for supporting inclusion, celebrating diversity, and working in one’s own life to help perpetuate these ideas. Thankful to writers like you and Emma who can better explain how to make that happen. I agree about the transforming (I want to say ‘transformative’, just for the feel of the word) aspect of the insight and approach Emma and family are leading out. Some other approaches to the autistic involve structure. Structure in presumption. Structure in intention. Structure in outcome. What Emma and family are doing is more like an all-in journeying, where tomorrow’s resource and setting is anticipated as being as wonderfully transcendent and surprising as today’s. Maybe like a yacht on the ocean. Where the only structuring is the core-discipline which keeps the yacht intact, under-sail, and intentional. Under-sail on an ocean which is constantly revealing itself anew. “…where tomorrow’s resource and setting is anticipated as being as wonderfully transcendent and surprising as today’s.” Yes!! This. Exactly. I think your whole family is amazing. It wouldn’t make sense for me to fight against my son’s autism since I’m autistic too. I think a lot of parents are on the spectrum themselves, whether or not they ever want to admit it to themselves, much less get diagnosed like I did. “… a lot of parents are on the spectrum themselves ….”. I agree Rosanna. I always then want to figure out: just how have the parents “got through”; how have they ‘passed’, if they have; why has their child run into more developmental difficulty than they did, if that is the case; how might we draw insight useful to the child, from understanding the parents in terms of the autistic. I think we then have to de-medicalise the autistic, de-pathologise the autistic; develop an affirming model of the autistic. The spectrum of the autistic includes, persons who have been developmentally obstructed by how we collectively view and understand the autistic, and persons who have ‘passed’ (as not-autistic) because their development has not been obstructed across their autistic aspect. Beautiful words, beautiful journey. And again, I cannot thank you enough. You changed, actually transformed my whole way of thinking. You transformed my life, our life. I was that mother who stayed up night after night reading, searching for a cure. The list went on and on, from supplements, to therapies to specific excersizes. I was on a roll. My husband came from overseas on one of his R&Rs and saw how one kitchen cabinet was filled, just filled with vitamins, oils, supplements. He couldn’t believe his eyes. My son became my guinea pig. I was desperate. Then as I was searching for yet another cure “stem cells” I came across your blog. And that was it. That was the beginning of the end to the countless experiments. It was the beginning of the end to my despair, to my silent tears, my silent screams. I became free. And most importantly my son became free. I started to read your blog from the beginning and I didn’t want to stop. You know how sometimes you feel this strange connection with someone, that’s exactly how I felt reading your words, your fears, your triumphs. I so wanted to pick that phone and call you lol it was like a euphoric eureka moment. I wanted to tell you, Ariane, I got it. I finally got it. I cannot describe in words the exact feeling, but it was more like having worn this heavy, old, dull cloak that just dragged my shoulders down for so long only to find myself in a flowy flowery light dress that twirled around so beautifully so gracefully. And, and I loved the feeling, I lived the feeling. I still am. We still are. Thank you. 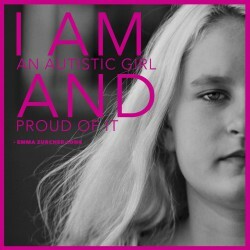 Thank you and Emma for being that inspiration. That inspiration I so desperately needed in a dark lonely time. And I want to also thank all your friends that made this possible for you. I hope, one day, that I too will have such wonderful understanding friends. Mina – this means so much to me. Thank you for telling me. This is exactly–EXACTLY–how I feel about Teenaged Son 2 and how far he’s come thanks to his own strengths and the people who support him.